camera (ABC News) Powerhouse Roundtable on "This Week"
Below is the rush transcript of "This Week" on October 5, 2014. It may contain errors. ANNOUNCER: On ABC's This Week -- new this morning, the patient in Dallas infected with Ebola now in critical condition fighting for his life. As health officials scramble to contain the deadly disease, new concerns about how the hospital handled him. Is the U.S. really prepared for an outbreak? Out Dr. Besser is here just back from the hot zone. Countdown to the mid-terms, just 30 days to go. What President Obama said that has Republicans pouncing. And can Hillary Clinton's barn-storming tip the balance in key states? Plus, honoring our wounded warriors: the new memorial opening today for all those men and women who have sacrificed so much for our country. Our Bob Woodruff is there. GEORGE STEPHANOPOULOS, ABC NEWS ANCHOR: And we begin with all the latest on the Ebola crisis. As that patient in Dallas struggles right now, so much fear the epidemic will spread right here in America. Look inside that plane landing in Newark airport yesterday, Homeland Security on board after officials in HAZMAT suits removed a man with flu-like symptoms. It turned out to be one of many false alarms being checked out right now by the CDC. RYAN OWENS, ABC NEWS CORRESPONDENT: George, good morning to you. Thomas Eric Duncan has now been at this Dallas hospital for a full week. And this morning, his condition is worse than ever. OWENS: The hospital will only say the Liberian national is in critical condition. His family says much more. His nephew tells ABC News, Duncan is not conscious he's so heavily sedated. He's gone into kidney failure and is on dialysis. The Ebola victim also cannot breathe on his own and is on a ventilator. Duncan's girlfriend and her family -- we blurred their faces to protect their privacy -- have been having their temperature monitored by CDC disease detectives twice a day. So far so good. UNIDENTIFIED MALE: We are confident that none of those with definite contact had any symptoms related to Ebola, none of them had fever. OWENS: The CDC says nine people in Dallas are considered at high risk for infection. Those four family members, plus a medical personnel. Approximately 40 other people who may have had contact with them are considered low risk. The hospital here may have missed the signs and sent Duncan home after his first visit, but now everyone else seems determined not to. UNIDENTIFIED FEMALE: We are not facing just a health crisis, we are facing a national security priority. OWENS: The result: a lot of false alarms. Two suspected cases around Washington, D.C. have tested negative. And Saturday, CDC investigators met a flight from Brussels at Newark International after a patient from Liberia got sick on the flight. Fellow flyers thought it might be Ebola. It wasn't. OWENS: Ebola symptoms usually show up eight to 10 days after exposure. Remember, Duncan has been here for seven days, so you do the math. Right now is the really anxious time for folks here in Dallas -- George. STEPHANOPOULOS: Let's get more on this now from the mayor of Dallas, Mike Rawlings. Mr. Mayor, thanks for joining us. I know you're right outside the hospital where Mr. Duncan is being treated right now. What more can you tell us about his condition? MIKE RAWLINGS, MAYOR OF DALLAS: All I know that he's been downgraded to critical and churches all over Dallas will be praying for him this morning. Our focus is on his contacts and really the safety of Dallas. Dallas is safe and Dallas is calm, but this is very serious and we're taking it as such. STEPHANOPOULOS: And mayor, you know there have been some complaints from the family about how they were treated early on, whether they got all the information they needed. Are you confident now that they do know everything that's going on and they're being cared for in the proper way? RAWLINGS: I am. I met them personally on Friday. We moved them to a secluded, safe area where the young child can play basketball and get out in the yard. We've got two people with them all the time taking care of their needs. And we're working with the other contacts to make sure they're there as well -- I mean, that they're taken care as well with all their questions are answered. I will say working with at least five different major jurisdictions in a process like this, you get moving a little slower than you want. I would liked to have done it faster, but I think we're up to speed and everybody knows what's happening now. STEPHANOPOULOS: Pretty confident now there will not be any other cases of Ebola? Or can't you say that yet? RAWLINGS: I really -- we really can't say that. I believe that if there is, we will have those contacts isolated the way our plan is in place. We've gone from nearly 100 down to just under 50. And we're playing a man-to-man defense, if you will, in a compassionate way. But we've got each individual really kind of focused on another individual to make sure that we monitor their temperature every two days. And then we're getting out and just living our lives in Dallas. The State Fair opened. We had the biggest opening in history. And I have been to an Octoberfest a mile away from where this happened and people are out all over the place. So I think Dallas sites are confident. And we are focused on what we need to be focused on. STEPHANOPOULOS: And what do you say to parents sending their kids back to school tomorrow? RAWLINGS: They are. And we plan for full attendance. The school system did a great job, parents didn't freak out. As far as I'm concerned, we only had a 10 point drop in attendance. And the students that were kept out, we've got them home schooling and have got a great education package in place for them with one-to-one tutoring. STEPHANOPOULOS: Thanks very much for your time this morning. STEPHANOPOULOS: Our chief health and medical editor Dr. Richard Besser just back from his second mission to the hot zone, spending the last week on the ground in Liberia tracking all the desperate efforts to save lives and keep this epidemic from spreading even more. DR. RICHARD BESSER, NBC NEWS CHIEF HEALTH AND MEDICAL EDITOR: Nice to be home after a really long journey. When my passport went through passport control it flagged me for additional screening, so they took me into a back room, asked me if I had had contact with anyone with Ebola, asked how I was feeling. I said I was feeling fine. They said welcome home. 4,500 miles away from the chaos in the West Africa hot zone where the day before we encountered a stunning moment on the street, workers coming to remove the body of an Ebola victim. Then, watch this. He's not dead. They were wrapping up to take him away, but he's alive. He's moving his arms. They almost took him away to the crematorium. I've seen health workers stretched to the limit from the streets to the Ebola wards, working valiantly to save lives and stop the spread of the disease. We've been here a week. It's time to go home. Now the airports are the new front line. And with so much Ebola here in Liberia, people want to know can you really keep it from leaving? I want to see how they're trying. Driving in, guards first check my temperature. Fever is one of the first signs of Ebola. Fever, no. Headache, no. Vomiting, no. Since I was fully covered in the Ebola wards, nothing that we did as journalists here put us in the high-risk category. But no one can be completely safe. American freelance cameraman Ashoka Mukpo contracted Ebola, now being flown to a hospital isolation unit in Nebraska for treatment. Back to that questionnaire where the information is key. This is a really good screening questionnaire, but it's only going to work if people read it carefully and tell the truth. Eric Duncan, the Liberian now in critical condition in a Dallas hospital did not. He had been in close contact with an Ebola victim days before boarding a plane from this airport and he didn't tell authorities. Before our departure, another checkpoint, a visual inspection to see if I look sick, my temperature taken a second time. Lots of checkpoints to make sure that people who are sick are not leaving the country. If you look sick, you have a fever, or you check yes on the questionnaire you're not getting out. We're given the all clear. On our first flight out of Liberia to Europe, some flight attendants wear masks and gloves. And there's no signs here with information saying anything about Ebola. But in many airports, like at our layover in Brussels, surprisingly it seems to be business as usual. STEPHANOPOULOS: And Dr. Besser joins us now. Welcome back, Rich. First thing people want to know, is it safe for you to be here? BESSER: Yeah, that's an important question. It really is. The thing about Ebola is you cannot transmit the disease until you have symptoms. So, ABC News talked with CDC, went through the recommendations, I'm monitoring my temperature. I took it this morning. If I develop a fever, then I would get care. But even with early fever, I wouldn't be able to spread the disease. STEPHANOPOULOS: And talk about the kind of precautions you took in Africa and on your way back. BESSER: Yeah, I mean, this -- the pieces people saw on TV didn't show those precautions. They saw me suited up when I was in the ward. And there, there are people actually watching all my interactions to make sure I didn't do anything that put me at risk, but every part of my body was covered. But scenes on the street after the camera went off -- spraying down with bleach, spraying my feet down with bleach. The first time I shook anyone's hand was when I arrived in Newark Airport, and it felt odd, because you don't touch anyone in Liberia. STEPHANOPOULOS: In Liberia, no touching at all. STEPHANOPOULOS: And the scenes you brought back so devastating right now. Are they making any progress in Liberia, in Sierra Leone at slowing down this spread? BESSER: You know, it was different. It felt different when I was there in August to how it felt this week. There's more international aid ramping up. They have a strategy. They're organizing these things. I interviewed the president. And she seemed to be in charge and in control and has the way. But it's a long way from strategy to getting this totally done. There's a lot more work that has to happen. STEPHANOPOULOS: And -- and your single biggest concern right now has to be this rate of spread. Each infected person still having contact with two, maybe three more. BESSER: Yes. Yes, that's the problem. Until they get enough treatment units up and people want to get in there and they're -- and they're being taken care of, they stay in the community and they're spreading the disease. And the -- the 17 treatment units the U.S. has -- has promised, none of them have even arrived or started to be built yet. And time matters. I'm concerned things are not moving fast enough. STEPHANOPOULOS: You sounded the alarm early on the need for a military effort and President Obama announced it afterwards. What's the most important thing that needs to be done right now? BESSER: Well, right now, you have the advance team from the military there scoping out the mission. But I don't get the sense of -- of urgency in how fast this has to happen. Every week that this goes on, you're having an exponential growth of this epidemic. We have to move faster and do more. We have to get medical providers there who are going to care for these patients. STEPHANOPOULOS: OK, Dr. Richard Besser, thanks. Let's take this now to Dr. Tom Frieden, the director of the Centers for Disease Control. You just heard Dr. Besser right there. DR. TOM FRIEDEN, DIRECTOR, CENTERS FOR DISEASE CONTROL AND PREVENTION: Well, absolutely. The virus is moving so fast. But our response is moving very fast, as well. The Defense Department is on the ground. They're working with 135 of the CDC staff who are there. They're working with USAID and others. The challenge is that putting up a treatment unit is not easy. It's not a question of construction, it's about training, supervision, supply chains. And all of that is -- is moving. But we wish it would move faster, but it's moving a lot faster than it was just a week or two ago. STEPHANOPOULOS: I want to get back to that in a minute. But let's talk about the situation here in the United States now, as well. We heard that a patient treated in Nebraska for Ebola, Dr. Richard Sacra, is now back in the hospital in Massachusetts. FRIEDEN: It's extraordinarily unlikely that it would be a recurrence of Ebola. We've never seen that. But we're not going to take chances. So we'll test and -- and we'll see. Time will tell. STEPHANOPOULOS: And the situation in Dallas right now. Nine people considered at relatively high risk, coming in direct contact with Mr. Duncan. Anything more on their condition right now and whether they have developed any symptoms whatsoever? FRIEDEN: Last we've heard, no one has developed symptoms of those who had contact. But we're going to check every single day, because some people did have, particularly family members, a lot of contact when he was sick and we know that his condition is quite critical, so we're really hoping for his recovery. STEPHANOPOULOS: Is there anything more you can do for him right now? FRIEDEN: Right now, the best thing to do is that meticulous kind of clinical care, of supporting his fluid and electrolytes, doing everything possible. And that's really the kind of thing that we want to get up and running in Africa, as well, supporting fluid balance and helping people survive, not just to reduce deaths, but so that more people will come in for care and that there will be less spread in the community. STEPHANOPOULOS: We saw that breakdown in communication at the hospital in Dallas. Are you confident that hospitals now across the country are prepared, have all the tools, have all the information they need to deal with this? Of course, I know you're getting so many more reports now coming in every single day. FRIEDEN: Well, the -- the way to stop this in its tracks, which I am certain we will do in the U.S., is when there's a case, to do contact tracing and follow-up, as is being done in Dallas and to have an index of suspicion so that if there is any concern that someone might have Ebola, immediately assess, isolate and, if appropriate, test. And that's what we're doing. We expect to see more concerns, more rumors and more possibilities of cases that require investigation. And that's what we're doing. STEPHANOPOULOS: But no sign of any new cases right now? FRIEDEN: No. We've had no other case. In fact, of the well over 100 cases we've been consulted about, the only one the staff told me, you know, we're really worried about this one, was the patient in Dallas, even before his test results came back. STEPHANOPOULOS: We saw that newest flight scare at Newark Airport yesterday. More cause for more drastic cutbacks on travel restrictions on travel for many, including some prominent Republicans, who are considering runs for the White House. I want to play them. UNIDENTIFIED MALE: It's just common sense. Why wouldn't we do everything we can to protect our folks here in America and stop these flights? UNIDENTIFIED MALE: (INAUDIBLE) concerned about 3,000 soldiers getting back on a ship. Can you imagine if a whole ship full of our soldiers gets Ebola? UNIDENTIFIED MALE: And the question that I think a lot of people are going to have on their minds is, what do you do with a person who is going to get on a plane in West Africa and come to America? Should there be a quarantine time period or something like that? STEPHANOPOULOS: What's your answer to that? FRIEDEN: I think, first and foremost, our top priority is the safety of American. And we will consider any options to increase that safety. We have to recognize that try as we might, until the outbreak is controlled in Africa, we can't get the risk here to zero. But we'll absolutely look at any suggestion that's workable and that wouldn't backfire. We don't want to do something that inadvertently increases our risk by making it harder to stop the outbreak there, because if it spreads more widely throughout different countries in Africa, that will be even more of a risk to us. STEPHANOPOULOS: So are you considering any new measures right now? FRIEDEN: We're absolutely going to look at all of the suggestions that have come in to see what would work, what's workable and what wouldn't have unintended consequences of actually increasing our risk. Our core mission is to work 24-7 to protect Americans. And that's what we're doing here. STEPHANOPOULOS: You know, finally, the researcher who first discovered the virus, Dr. Peter Piot, warned this week that there is a very real danger of what he calls a complete broken in parts of West Africa. Other researchers suggesting the possibility of a global pandemic. How real is that threat? FRIEDEN: Well, first off, here in the U.S., I remain quite confident we will not have a widespread outbreak. We will stop it in its tracks, because we've got infection control in hospitals and public health that tracks and isolates people if they get symptoms. In Africa, the story is different. We did help Nigeria, Lagos, stop an importation. They had one case. They ended up having to do 19,000 home visits. They had more than 1,000 health workers involved. We had to bring our own staff, a dozen of them, and 40 of our trained epidemiologists from around Nigeria to help with that response. And they look like they've stopped the outbreak there. But that kind of intensive response is hard to marshal everywhere. And I'm quite concerned the longer this goes on in these three West African countries, the greater the possibility that other countries in Africa are going to have to fight this on their territory, as well. STEPHANOPOULOS: So much danger still out there. Dr. Frieden, thanks very much for your time this morning. Up next, inside the minds of school shooters inspired by Columbine. Can they help us prevent the next tragedy? It's an ABC News investigation. And we're counting down to the midterms. The roundtable will weigh in on Nate Silver's latest analysis and how the war against ISIS is topic A on the airwaves. STEPHANOPOULOS: Today's Closer Look, the legacy of Columbine. Every since that mayhem 15 years ago, we've seen more and more of these mass shootings, many by troubled young men inspired by the Columbine killers. In this ABC News investigation, Pierre Thomas and his team dig into what drives these boys to unlock the mystery of why they snap and what can be done to stop them. PIERRE THOMAS, ABC NEWS CORRESPONDENT (voice-over): Columbine High School, April 20, 1999. UNIDENTIFIED FEMALE: Shots fired at the Columbine High School. THOMAS: Its deadly legacy still echoes today. UNIDENTIFIED FEMALE: Active shooter, Sparks Middle School. They have at least two down. THOMAS: October 21, 2013, a Nevada boy, only 12, shoots and kills a teacher, wounds two students then takes his own life. Police find pictures of the Columbine killers on the boy's cell phone. April 9, 2014, Franklin Regional High School near Pittsburgh, chaos as a 16-year-old boy goes on a stabbing rampage, injuring 22. May 1, police say they stopped a Minnesota boy, 17, from bombing and gunning down his classmates. Here he is testing his homemade explosives. All these cases share one common trait -- all the suspects were inspired by or somehow tied to the Columbine tragedy, when Eric Harris and Dylan Klebold hunted down and killed 12 students and a teacher in cold blood. ABC News identified 17 school attacks and 37 serious threats linked to Columbine since the massacre, among them the slaughters of Virginia Tech and Newtown. At least 10 other cases came in the last year alone, as this disturbing phenomenon seems to be intensifying. In Pasadena, California, at the start of this school year, two students accused of planning another school massacre. UNIDENTIFIED MALE: They just wanted to kill as many people as possible. THOMAS (voice-over): A three-month ABC News investigation spanning the country uncovered chilling evidence, video diaries, journals, police interrogations where the Columbine killers often emerged. Here's that Minnesota suspect talking to police in May. UNIDENTIFIED MALE: My number one idol is Eric Harris. I continue to see myself in him. THOMAS (voice-over): This 16-year-old Tampa student was also allegedly planning a murderous nightmare. UNIDENTIFIED MALE: I'm the Freedom (ph) High School shooter in Tampa, Florida. Well, I will be. Columbine, Virginia Tech, none of them will beat me. I'll kill them all. I can't wait to die, dude. THOMAS (voice-over): Perhaps no case demonstrates the Columbine obsession more than the 2006 shooting spree of this sadistic North Carolina killer. He convinced a family member to drive him to Columbine. UNIDENTIFIED MALE: Columbine High School, right there. And you see over there? That's the library. That's where everything took place, right there. THOMAS (voice-over): He'd bought the same guns. UNIDENTIFIED MALE: This, my friends, is what Eric Harris used in the Columbine massacre. THOMAS (voice-over): Even dressed like them. UNIDENTIFIED MALE: Operation Columbine is underway. THOMAS (voice-over): Tragically, it was more than just playacting. The suspect shot and killed his father, then opened fire in his high school, wounding two students. THOMAS (voice-over): He was arrested in this T-shirt. Some of the killers in Columbine worshipers are mentally ill. Someone want attention. Others feel slighted and have specific grievances that spiral out of control. UNIDENTIFIED MALE: They're looking for things that align with whatever their perceived grievance is. They have taken an unusual fascination in Columbine and other large-scale horrific attacks. UNIDENTIFIED MALE: The modern era of actor shooter events really began with Columbine. UNIDENTIFIED MALE: The copycat phenomenon is real. They're looking to those attacks for inspiration and sometimes it even turns into sort of a hero worship. THOMAS (voice-over): These troubled young men and women dream of unspeakable carnage. Those who've actually attacked wounded and killed scores of innocents who should never be forgotten. In the cases we studied, 66 killed, 59 wounded. How can this dangerous phenomenon be stopped or at least slowed? We sought answers from Dillon Cossey, now 21, but who, at 14, was arrested for allegedly discussing a plan to attack his high school outside of Philadelphia. Cossey told me there was no specific plot and that he does not believe he would have carried out an attack. But he admits to fantasizing about acts of violence against peers, who had been taunting him. DILLON COSSEY, POTENTIAL SCHOOL SHOOTER: What really drew me in to that dark path that I was on is -- was that sense of hopelessness. And you start to associate with people who may discuss those kind of violent acts, because they're the only people that at the time you feel that understand you. UNIDENTIFIED THOMAS (voice-over): He began researching Columbine. COSSEY: And when I heard that these kids were bullied and that's why they did what they did, that's when the thought goes, "I was bullied, too." THOMAS (voice-over): After being arrested, Cossey received years of court-ordered therapy. What would Dylan of today tell the Dylan of seven years ago? COSSEY: I would probably tell him that you're stronger than you think you are. You're not alone. There's more support out there for you than you could even think possible. You can move forward beyond anything that you're going through and move ahead with your life to a better place that you thought you could. Remarkable report. This phenomenon's so real; the big question, what can be done to stop it? THOMAS: Well, one of the things law enforcement is looking at is trying to get mentally ill people more support. Also to do something about bullying. And to identify children who are struggling, who have these dark thoughts, that may not have manifested itself until the last moment. STEPHANOPOULOS: And when they go down that rabbit hole on the Internet, you need a counter. THOMAS: Well, when we spoke to that young man, he said when he started researching Columbine, he said it would have been great if something else popped up to say, this is not the way, that you don't have to go to acts of violence. But the thing that struck me is that this is a real phenomenon; it seems to be intensifying and it's happening out there right now. STEPHANOPOULOS: Thanks so much for bringing this report to us, Pierre Thomas. Thanks very much. Coming up, the roundtable here to weigh in on the scandals shaking up the Secret Service, all the week's politics, Hillary Clinton back on the campaign trail. Can she help Democrats in ways President Obama cannot? Her first big test for 2016 and we're back in just two minutes. UNIDENTIFIED MALE: The director of the Secret Service resigned today. Yes. She said that she's going to miss being in the White House, but knowing the Secret Service, she should be able to come back anytime she wants. UNIDENTIFIED MALE: The door is always open. UNIDENTIFIED MALE: How did this intruder get so far into the White House? Don't they have -- don't they have guard dogs there? UNIDENTIFIED FEMALE: There were a lot of officers there and there was concern the dogs might attack them instead. UNIDENTIFIED MALE: Sounds strange. But it makes more sense when you find out a lot of Secret Service agents are cats. STEPHANOPOULOS: Oh, that (INAUDIBLE) of the Secret Service target practice for late night comics, not so funny at the White House, where they forced out director Julia Pierson after tone-deaf testimony on Capitol Hill. Top lawmakers now calling for a top-to-bottom shakeup. ABC's chief White House correspondent Jon Karl has more on what it will take to restore confidence in the president's protesters. JONATHAN KARL, ABC NEWS CHIEF WHITE HOUSE CORRESPONDENT (voice-over): In 1981, when Secret Service agent Tim McCarthy (ph) took a bullet for Ronald Reagan, he was just doing his job. The bond between and agent and a president is built on trust and respect. And despite the agency's security lapses and scandals during his six years in the White House, President Obama has always stood up for the Secret Service. UNIDENTIFIED MALE: Are you still confident in the Secret Service? BARACK OBAMA, PRESIDENT OF THE UNITED STATES: The Secret Service does a great job. I'm grateful for the (INAUDIBLE) they made on my behalf and my family's behalf. UNIDENTIFIED MALE: Do you solemnly swear...? KARL (voice-over): A week later came Director Julia Pierson's disastrous appearance before Congress. UNIDENTIFIED MALE: Profoundly inadequate, shocking, disgraceful, outrageous. Is there any one of those adjectives you'd disagree with? JULIA PIERSON, FORMER DIRECTOR, U.S. SECRET SERVICE: No. KARL (voice-over): Her resignation came after a series of new revelations first reported by "The Washington Post," September 19th fence jumper armed with a knife made it much further into the White House than the Secret Service first said. Back in November 2011, it took the Secret Service five days to figure out that bullets had struck the White House. And last month, the final straw: the disclosure that a man with a criminal record carrying a gun got onto an elevator with the president during a trip to Atlanta. KARL: How dark a moment is this? UNIDENTIFIED MALE: It's an embarrassment. It's not our brightest day, no question. But the Secret Service has a 150-year history and we don't go away. If there's something that's broken, we fix it. KARL (voice-over): The once exalted agency is now facing intense scrutiny. STEPHANOPOULOS: Let's talk about this now in the roundtable, joined by Peggy Noonan from "The Wall Street Journal," CNN's Van Jones and one of the top teams in political journalism, authors of "Game Change" and "Double Down," now the managing editors of Bloomberg Politics, Mark Halperin and John Heilemann. Your new program, "All Due Respect," premieres tomorrow. And Mark, let me begin with you. The White House had no choice on Pierson by the end of the day on Tuesday. But they did not want to push her out. MARK HALPERIN, SR. POLITICAL ANALYST, "TIME": They don't want to. No president wants to fight with the Secret Service, the Pentagon, the intelligence agencies. Those are tough bureaucracies to take on. I would have preferred the president fire her rather than letting her quit. Management -- it was his selection, when people say this is not really his -- his problem, he picked her to run the Secret Service. It is unacceptable for the country. We all respect the individual agents and the job they do, but it's unacceptable for them to be so weak. And I would have preferred he fire her and announced big changes right away. STEPHANOPOULOS: Especially, Peggy Noonan, after the Director Pierson did not reveal that elevator incident when she spent a whole day testifying on Capitol Hill. NOONAN: It was so amazing. She talked and talked and talked in her testimony. Then it ends. Then "The Washington Examiner" and "The Washington Post" come out with this information that she somehow forgot to include about the scariest incident, the president in the elevator, a guy jumping around and he's got a gun and a -- apparently, an unfortunate past. NOONAN: -- we've got to have it working. It's got to be working tomorrow morning. STEPHANOPOULOS: And John Heilemann, that is a good point, the White House now, the -- this first review is only in the incidents that have been reported. STEPHANOPOULOS: It's not a top to bottom review. HEILEMANN: It was a congressman. There was confusion. They eventually found out and they got him out of there. But, again, how that guy got back there, there are a lot of questions about it that should be discussed in a -- in a top to bottom review that goes back historically. And then the question of how you get to the point where people have confidence in the -- whatever the review finds, which is that we'll never see the results, even if it's successful, even if changes are made, it's hard to demonstrate those things going forward, right, because of the way the Service operates. STEPHANOPOULOS: And Van Jones, one of the concerns -- and I was struck by this front page story in "The New York Times" this week. It talks about blacks seeing flawed shield for president. They quote Congressman Emanuel Cleaver saying, "Well, the Secret Service, they're trying to expose the president." You hear a lot of that from African-Americans and particularly in particular, this concern that somehow the Secret Service isn't doing all they should be doing for their president. JONES: Yes. Well, first of all, I -- I think that is unfair. I -- I did get a chance to work in -- in the White House, I know how hard this job is. Let's -- let's not forget, if you're a Secret Service person, you are one second away from history being made in a negative direction your entire time you're there. JONES: This is a very high stress job. People sign up for this job. We -- we have to respect them and appreciate them. But we have to remember the history of African-American leaders being killed in this country, whether you're talking about Medgar Evers, whether you're talking about Malcolm X, Martin Luther King. So there's a big sensitivity in the black community to -- the most -- minute he first announced, every African-American that I knew above the age of 50 said, he's going to be killed. And so there is a huge concern that this level of -- of shenanigans is going on. The last thing I want to say is this president has been threatened more than any other president and -- and we -- he deserves a better job. I wish that the -- I wish that the Secret Service had only the job of protecting the president, not all this other stuff. NOONAN: Yes, there's a sort of laxness one perceives that is going on in the executive agencies. To my mind, as I look at this White House six years in, I see a great deal of articulate thought and a great deal of -- of, you know, let's do some rah-rah, some build the spirit, some this and that. But they don't seem that good at running the government, at running their own agencies. There have been a series of scandals, as we know, from early days of GSA through the Veterans Administration, which I think is a very tough mishandling by the government. This latest one is just a -- the Secret Service. It feels like things aren't quite working anymore. STEPHANOPOULOS: How big an issue is confidence in the midterms? HALPERIN: I think it's a big issue if the Republicans are able to make it one, because happiness with Washington goes to both parties. But the president does run the executive branch. Republicans, I don't think, have found a way to talk about it and connect it up to the economy. So potentially a big issue. And I think it -- it should be something discussed. But I haven't seen any Republican candidate actually draw the lines together in a way that's that relevant to voters. STEPHANOPOULOS: We want to talk more about the midterms when we come back. We've got to take a break right now. We're going to be back to analyze all the midterms and the latest on 2016. Does George W. Bush really know what his brother Jeb wants? And that leads us to our Powerhouse Puzzler on Bush's grandfather, Senator Prescott Bush. So here's the question, guys. Name the state he's represented in the Senate. And bonus points if you know the year he was first elected. STEPHANOPOULOS: OK, who knows their Bush history? Senator Prescott Bush, which state did he represent? UNIDENTIFIED MALE: The Nutmeg State. STEPHANOPOULOS: Boy, everybody gets Connecticut. And Peggy and Van get 1952. Excellent. UNIDENTIFIED MALE: Peggy went multiple choice. NOONAN: Wait, no, that's not what it says. UNIDENTIFIED MALE: We finally got one, Peggy. STEPHANOPOULOS: We're back now with our Politics Buzz Board. Topping it off, just one month from Election Day, ISIS invading campaign airwaves. Tough GOP ads in tight Senate races, from New Hampshire to Colorado, like this one in North Carolina from Thom Tillis. UNIDENTIFIED MALE: While ISIS grew, Obama kept waiting and Kay Hagen kept quiet. UNIDENTIFIED FEMALE: I think North Carolinians need to know his position. And he is spineless in this regard. STEPHANOPOULOS: President Obama talking up the economy and his agenda. BARACK OBAMA, PRESIDENT OF THE UNITED STATES: I'm not on the ballot this fall, but make no mistake, these policy are on the ballot, every single one of them. STEPHANOPOULOS: But was it smart to make the mid-terms an Obama referendum? GOP candidates pounced. And new grandmother Hillary Clinton is hitting the trail. Politico reports that show barnstorm key mid-term states like Colorado, Iowa and New Hampshire when not babysitting Charlotte. Add it all up, and Nate Silver's team at FiveThirtyEight gives the GOP a 59 percent chance of retaking the Senate, down one point from last week. 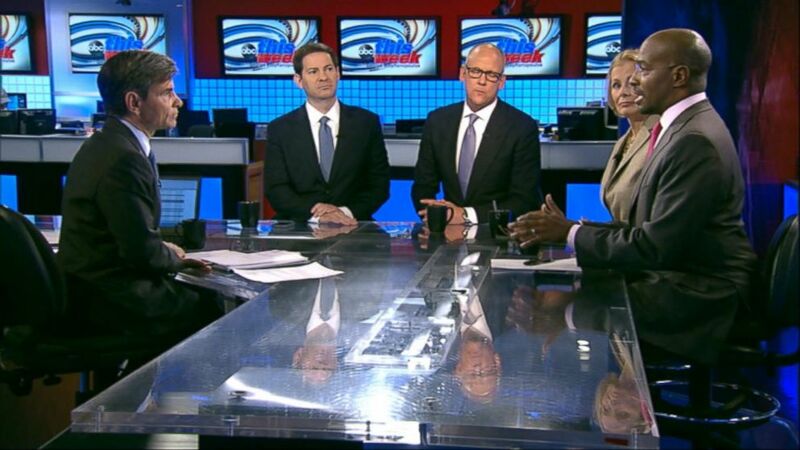 STEPHANOPOULOS: Back now with the roundtable. Mark Halperin of Bloomberg as Nate Silver right to move it just an inch away from the Republicans? HALPERIN: I don't know, in the world of margin of error, I'm not sure that's much of a move. You know, right now Democrats must change the electorate. And I think read needs to be President Obama injecting his economic record in. And you see him attacking Fox News in that same speech is because they need to change the electorate. They need to get the coalition of the ascendant, the Obama voters who don't normally vote in the mid-terms to vote in places like North Carolina and Iowa. HALPERIN: Republicans do. I think right now they would get the final three. STEPHANOPOULOS: Pat Robertson not closing the gap there at all. Van Jones, I have to ask you this, I understand what Mark is saying about energizing the Obama electorate, but it did not seem like a wise move for the president to put his agenda front and center like that. JONES: Well, we've got to get our base going. The other thing, too, is that we can't let the Republicans get away with some of the stuff they're doing this week just trying to bash Obama. Hey, you know, government is always their enemy until you need a friend. This Ebola thing is the best argument you can make for the kind of government that we believe in. A year ago, Ted Cruz shut down America's government, shut down the CDC over shenanigans. What if that happened this year? You've got to start putting the Republicans on the defensive for the fact that they believe that you can take a wrecking ball to America's government, never pay a price. Obamacare means that 8 million people who couldn't have gone to the doctor last year, if they feel sick today, they went if they got Obama (ph) they can go see the doctor. The Democrats have got to start talking like that. STEPHANOPOULOS: But Peggy, that does not seem to be top of mind of voters right now, and certainly the campaigns -- at least the Republican campaigns -- want to make this ISIS issue front and center. NOONAN: Yeah, there's ISIS, there's a bunch of stuff. Look, the Republicans in some of the close cases have been very interested in hanging the past six years on their Democratic opponent. So I think that the president meant to help his Democrats out in the field when he said in his speech the other night, "I am not on the ballot, but my agenda is." Well, how many Republican Senators moved forward and started saying that's right, it's his agenda that we're voting on. I don't think that did him, or them a lot of good. STEPHANOPOULOS: And we'll see the president raising money, John Heilemann. We will not see him in those close states. But as you're going to write about in Bloomberg tomorrow, we will be seeing a lot of both Hillary Clinton and Bill Clinton. HEILEMANN: I mean, it's really striking. If you think about the races that are in play, President Obama is welcome virtually none of those states. He will not be going to most of these close contested Senate races, some of the governor's races, but he's going to basically be on the coast raising money. Hillary Clinton is welcome everywhere and will be almost everywhere. And then her husband also welcome everywhere and will be almost everywhere. They can do things there if the candidates want them there. As a matter of persuasion, as a matter of getting out the vote. And I think it signifies the kind of big moment in the party, because it is this -- you know, for the last six years, this has been Barack Obama's Democratic Party, it has not been the Clinton's party, they had been in the wings. This is the moment where they come out and they more or less take control of the Democratic Party. STEPHANOPOULOS: But they're going to have to show -- put some Ws on the board. HEILEMANN: They are going to have to do that. HALPERIN: And you can even go back longer than six years. Remember, Barack Obama came to national prominence in 2004, got elected. What did he do in 2006? He campaigned everywhere in the mid-terms. He went to Missouri, he went to northern Florida. He was welcomed everywhere. And as John's piece makes clear, right now there are very few places in this country where there are contested races to be as well. STEPHANOPOULOS: You've got more people going to the polls, Van Jones, saying they want to vote and send a message against President Obama than those saying you want to send a message for him. JONES: Well, that's true. This president is not as popular as he once was. But he is not wrong. His policies are incredibly popular. You have a Republican Party that won't raise the minimum wage, that won't extend unemployment insurance to active job seekers who just need a little bit more runway, they won't be for fair pay for women, they won't help on student loans. So the Republican agenda is incredibly unpopular. Just because President Obama is not as popular, we've got great people out there like Elizabeth Warren, like Hillary Clinton, and Bill Clinton to build that case. I think that's important. STEPHANOPOULOS: And these races still are close. We're seeing Jeb Bush out on the trail as well. And we did hear from his brother, the former president, this week. GEORGE W. BUSH, 43RD PRESIDENT OF THE UNITED STATES: Yeah, I think he wants to be president. I think he'd be a great president. He understands what it's like to be president for not only the person running, or serving plus family, he's seen his dad, he's seen his brother. STEPHANOPOULOS: So, a little nudge right there. NOONAN: Oh, no, his numbers are going up. STEPHANOPOULOS: ÉJeb Bush, he seems to be holding back a little bit. NOONAN: This was the first time the interview with former president George W. Bush that I thought, jeez, maybe Jeb is going to go forward. I had been feeling his ambivalence. May I say, Van, I think the story of next month's election is on the Republican side, the past six years didn't work. And on the Democratic side, ha ha, we're not sure the past six years worked. Let's look at Hillary and Bill. That, I think, is the under meaning of all of it. STEPHANOPOULOS: You guys nodding your head when Peggy was talking about Jeb. HALPERIN: I've got a piece -- John is writing about the Clintons, I've got a piece about Jeb coming about where he stands. And it's funny, this week he was out impressing people on the campaign trail, raising money. There are those who say he's definitely in. I had three calls from people this week saying he's in. And there are people saying there's no way he's running, because of three generations of Bush women. The reality is, it's both more simple and more complicated, he hasn't decided. But he is much closer to running than people realize. STEPHANOPOULOS: If you haven't decided at this point, are you running? HALPERIN: He can decide in January. JONES: Here's what you've got to say, if you want to put competence on the table, you've got a Republican Party with Chris Christie, Ted Cruz, Rand Paul and somebody named Bush. I'll take that fight in 2016 any day, any day. STEPHANOPOULOS: Which is why some people -- we have a few seconds left, John Heilemann, which is why some people are talking about your first guest on your program tomorrow Mitt Romney opening the door just a tiny, tiny bit. HEILEMANN: Opening the door more than a tiny bit. You know, there's a story Byron York wrote this story this week, had talked to a lot of Romney people and it was a very obviously planted story. He had cooperation on background from a lot of people in Romney's world who were saying, yeah, he's really looking at it. I think he's been looking at it more and more seriously over the course of the last few months. And I think he's more interested today in some ways for some of the same reasons that he actually got in the race in 2012, which was he looks at the field that Van just talked about and says I don't think there's anybody else out there who might be able to win. HALPERIN: If Jeb runs, he won't. NOONAN: But the elites and the moneymen also like Romney a lot, as much as they like Jeb. So that might be a little interesting to see. No? STEPHANOPOULOS: Cannot decide until after Jeb. We've got to take a break. Up next, we're on the front lines of those massive protests in Hong Kong. Will they turn violent? What it will mean for U.S. ties to China. That and more in our exclusive interview with Treasury Secretary Jack Lew. STEPHANOPOULOS: Back now with our Facebook find. Trending right now, pro-Democracy protests in Hong Kong. Government officials order thousands of demonstrators off the streets, setting the stage for a major showdown. ABC's Mohammed Lila is in Hong Kong with the latest. Good morning, Mohammed. MOHAMMED LILA, ABC NEWS CORRESPONDENT: Good morning, George. From here in downtown Hong Kong, we are just hours away from the government's deadline for this protest site to be cleared. But take a look around, the protesters aren't going anywhere. In fact, their numbers are growing by the hour. Today, for a brief moment, it looked like the protesters were almost going to give up a couple of their smaller protest sites after someone started spreading rumors that they'd reached a deal, but the protest leaders quickly rejected those reports, insisting they are here to fight until the very end. Now this all has to do with the people here fighting for the right to elect their own leaders, not just leaders who were from a list of a preapproved candidates in Beijing. Now no one knows what's going to happen tonight with the deadline just a few hours away, but they're not taking any chances. Take a look, people here are handing out surgical masks, because they know that police have used tear gas once and there's a real fear that we could see a repeat of that in just a few hours -- George. STEPHANOPOULOS: OK, Mohammed Lila, thanks very much. STEPHANOPOULOS: We're joined now by the Treasury Secretary, Jack Lew. Jack, welcome, Mr. Secretary, welcome here this morning. You have worked so closely with the Chinese leaders. How concerned are you about a violent crackdown, and what would that mean for relations (ph) with the U.S.? JACK LEW, TREASURY SECRETARY: Good to be with you, George. Obviously, we're watching the situation closely. It's very important that the situation be resolved through peaceful discussion. STEPHANOPOULOS: Has that been communicated to the Chinese? LEW: I think that there have been conversations through our national security channels. The president dropped by when the foreign minister was visiting just last week at the White House. And I think we all need to send the same message. It's important this be resolved through discussion and peaceful discussion. STEPHANOPOULOS: Let's talk about the economy. Solid jobs report on Friday. Unemployment below 6 percent for the first time in -- since 2008, on track for the best job creation in almost 15 years. But as you know, Americans are just not feeling it. I want to show our latest ABC News poll, 69 percent of Americans think we're going -- the economy's not doing so well. Over half of the country disapproves of the job that President Obama is doing on the economy. Are you worried that at some point this lack of confidence becomes self-fulfilling? LEW: You know, George, I think there's no question but that the economy is moving strongly in the right direction. The jobs numbers on Friday were not just the first proof of that, but we've seen six months now of pretty sustained evidence of that progress. You've got to remember where this started. When the president took office, we were losing 800,000 jobs a month. Over the last six months we've been growing 227,000 jobs a month. That's a huge swing. And it is affecting the lives of Americans, but there's also a lot of memory of where we were in '08 and '09. The president spoke this week to what we need to do to make sure that the -- that the recovery reaches the lives of middle class Americans. And let's remember it's not just because it's the right thing to do and it's fairness (ph), it's how we grow our economy. STEPHANOPOULOS: (INAUDIBLE) -- Congress for that. That's not happening right now. Is there anything the president can do on his own? LEW: Well, look, we've done quite a lot since the president took office. We -- when I became Treasury Secretary just under two years ago, we were still at the end of the period when the world looked at the United States as having been the source of the financial crisis. Just two weeks ago, I met with my counterparts at the G20 meeting and what I hear now is how do you have the resilience to bounce back? The answer is we make policy. We've made tough decisions. The beginning, at the start of the administration, but it caused the growth, helped to drive the growth in the economy. We have more policy that we need to do and nobody should write off the next two years. Nobody should expect that we're not going to get more done in the next two years. STEPHANOPOULOS: I want to talk about a scary cyber attack this week, JPMorgan revealing that 83 million households and businesses had their personal data compromised. "The New York Times" reports that about nine other financial institutions also had similar breaches. And they point the finger at hackers from Russia, even suggesting there may be ties to the Russian government. LEW: Look, George, the JPMorgan incident is under investigation; and I'm not going to comment specifically on that. But I will say this, George, we have made enormous efforts to bring attention to this and resources to this. The president's taken action through an executive order. I've spoken to it publicly, as recently as this summer in New York and I met with CEOs in the financial sector quite regularly since becoming secretary. They're taking it seriously. I don't think there's a CEO in the financial sector that doesn't wake up in the morning with this on their mind. Now the fact of the matter is that cyber attacks don't have to come from big, well-organized forces. You know, one smart person and one bad person can do an awful lot of damage. It's something that we have to pay attention to every day. We still need legislation to make it easier for the industry to cooperate. And one thing I will just caution is that some of the things I've read confuse factors. Attacks are not the same as getting into a system. And I think that some of the reports are confusing the two. STEPHANOPOULOS: So no concern about Russian government? LEW: Look, I -- we have a lot of concerns about the sources of attacks because there are many different sources. But I'm not going to comment on the specifics in JPMorgan. STEPHANOPOULOS: Final question: the NFL's been under a lot of scrutiny as well, including the fact that they still are considered a non-profit, the NFL. For tax purposes, it -- even though they take in about $10 billion in annual revenue, is that justified? I mean, baseball isn't a non-profit anymore. The NBA isn't. LEW: So I will say that I've, like everyone else, paid attention to what's been going on. The NFL recently haven't paid attention to their tax status. So I can't comment specifically on it. STEPHANOPOULOS: Some members of Congress all calling for it to be taken away. LEW: So, look, the -- I think that what clearly is an order is to do some soul-searching about some of the things going on. STEPHANOPOULOS: And we'll be back with America's newest war memorial after this from our ABC stations. STEPHANOPOULOS (voice-over): In THIS WEEK's "Sunday Spotlight," a new honor for America's wounded warriors. So many of our veterans coming home disabled from Afghanistan and Iraq, injuries both visible and invisible. And today the first memorial for all U.S. troops disabled in combat is opening in Washington. ABC's Bob Woodruff has the story. BOB WOODRUFF, ABC NEWS CORRESPONDENT (voice-over): There are many monuments for soldiers who've paid the ultimate price for America. But for those who have returned wounded from the war, this new tribute, two acres of glass and granite, is theirs. UNIDENTIFIED MALE: This is a memorial to living disabled veterans. It's the first and only of its type in Washington. WOODRUFF: When we memorialize, when we give honor to those that we lost in the wars, those who died, it's looking back, but this is more looking forward? UNIDENTIFIED MALE: We have to remember that when you come home from war, your battle is just beginning. It's going to last the rest of your life. And someone has to be there to take care of you. WOODRUFF (voice-over): Art Wilson (ph) cofounded the group that built the memorial and is a disabled veteran who served in Vietnam. There are nearly 4 million veterans suffering from wounds today. And this weekend, hundreds of them have been pouring in from around the country for the dedication. When tourists come here, starting Monday, they'll likely meet Park Ranger James Pierce (ph). This isn't just a regular job for him. As an Army sergeant, he was severely wounded two years ago by a suicide bomber in Afghanistan. Three members of his unit were killed. WOODRUFF: You're now in this position where a big advocate of this particular memorial, now you're helping the other veterans that are following after you. JAMES PIERCE (PH), PARK RANGER: To me that's what it's all about, just helping one another just to make it through it. PIERCE (PH): One team, one fight. WOODRUFF (voice-over): Surrounding the site are glass panels and bronze sculptures, many just outlines, symbolizing people not quite whole. Many Americans have never met a disabled veteran, insights their lives sometimes only captured by Hollywood. Actor Gary Sinise has helped to raise the money to build the memorial. And he says his commitment to the wounded sparked with this film, "Forrest Gump." GARY SINISE, ACTOR AND ACTIVIST: I just found that there was something that I could do as a public person to recognize, first of all, what they were going through, show some gratitude and some appreciation and draw some attention. WOODRUFF: Now we've got wars that are now winding down that are the worst in terms of wounds in the wars we've ever had. SINISE: Yes, and we're going to be feeling those residual effects from these wars for many, many years to come. I feel like all those soldiers, all those Marines, all those sailors, all those airmen, they should at least, at the very least, know that we are aware and that we care. WOODRUFF (voice-over): And at this remarkable new site, they will -- for THIS WEEK, Bob Woodruff, ABC News, Washington. STEPHANOPOULOS: Amen to that. We all are aware; we all care. THIS WEEK the Pentagon announced the deaths of three service members supporting operations in Afghanistan and Iraq. STEPHANOPOULOS: That's all for us today. Thanks for sharing part of your Sunday with us. Check out "WORLD NEWS TONIGHT;" and the new political show from our sister network, Fusion, "Midterm Mayhem," also premieres tonight. I'll see you tomorrow on "GMA."